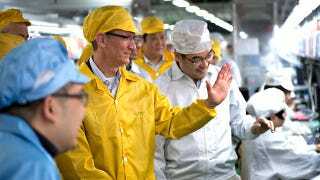 Apple CEO and fleece jacket advocate Tim Cook is in China, and decided to swing by the factory that cranks out our pads and phones. Maybe it's just all the n-hexane in the air, but things look cheery! Extra rations! Reuters reported that photographs provided to the news service by Apple dated Wednesday showed Mr. Cook smiling and meeting workers in the facility.